eCite - Pathways into policing - a gendered experience? Pathways into policing - a gendered experience? Few occupations have been so fully defined as masculine and as resistant to the integration of women as policing (Martin 1996), but little research has been done on what motivates women to seek employment in this male dominated occupation. Despite increased research into women in policing over the past two decades, most studies have focused on barriers facing women after they become officers. The aim of the current study is to examine whether there are identifiable pathways into policing as a career choice; whether factors predictive of various pathways can be identified and whether socialization plays a role in individual perceptions of policing as a suitable career choice. 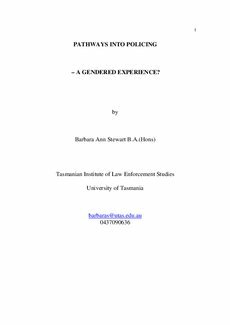 Further, does a policewoman’s gender identity influence her experience of policing i.e. is there a relationship between ‘doing gender’ and ‘doing policing’? This paper outlines the results of a survey of male and female constables, and initial findings from interviews with female constables.